When we were an agrarian nation, all cars were trucks, because that’s what you needed on the farm, but as vehicles started to be used in the urban centers, cars got more popular. Innovations like automatic transmission and power steering and things that you didn’t care about in a truck as much started to become paramount in cars. 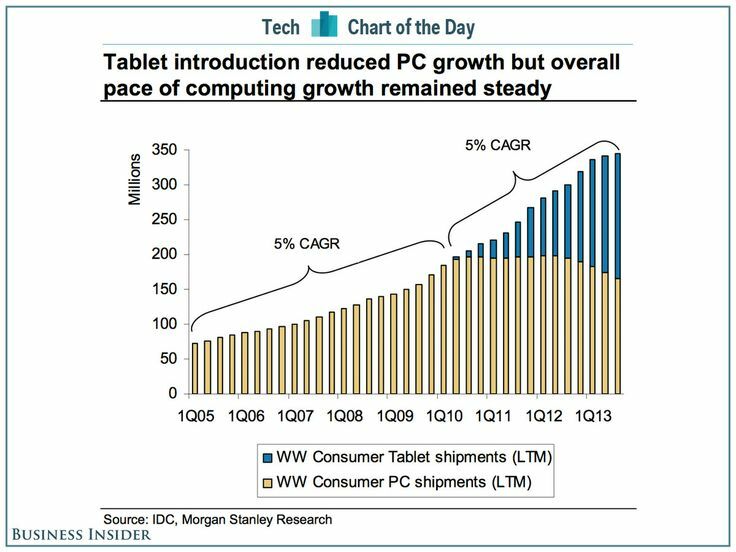 … PCs are going to be like trucks. They’re still going to be around, they’re still going to have a lot of value, but they’re going to be used by one out of X people. Y es que cuando un amigo o familiar me pide consejo sobre su próximo PC o portátil yo intento casi siempre redirigirlo hacia la compra de un tablet tipo iPad o mini-iPad (el que uso yo)… si eso falla, porque tienen necesidad de imprimir, escribir mucho o algo similar… entonces les recomiendo un Surface de Microsoft y ya si eso no les vale entonces un portátil.